I stayed in Sardana for three nights. 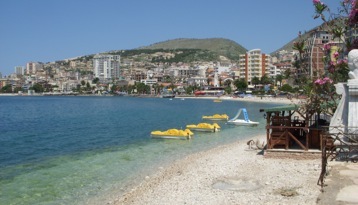 Sardana is a horseshoe bay that has boats going to Corfu Greece. The house I stayed at was very comfortable and quite and up the hill from the busy areas, only 1000 lek/$9.00 a night. The family was very nice, but reserved and just unsure about the tourist/traveler concept. But, they did wash my clothes; so far, every time I ask for a bucket to wash my clothes they insist on washing them for me in their washer. Sardana is fairly new to the tourism concept. All these tall buildings have been built within the last 10 years. The town was small, and just look at how they built the place up, ironically, most of these buildings are vacant. Their idea of the tourism concept is cafes/bars and rotten fast food, but the fish here is decent for the extra buck. Albania (at least the south) is just a weird country, and many locals have confirmed my perceptions. There is a lot of victimization in the southern region, the central area of Albania such as Korca, and my current location, Berat, contains a much less victimization baggage and feels more positive. In the south there is a cultural dynamic of shiftiness, the bottom line is that some areas, such as the south, have trust issues and I don’t think they even trust themselves. And, of course, money is the prime issue. Now, I am referring to the cultural entrainment of the atmosphere, not an absolute generality. Each country carries a particular and unique mind-set, cultural dynamics, and unique emotional behavior that the dumb-downed majority automatically acts upon, but, varies from place to place within the country. The other night I visited with a guy from Kosovo and he agreed upon the strange cultural dynamics of Albania. The Balkans are known for people being lazy. I thought many Bulgarians were lazy, heck there is no comparison, Albanians are very lazy and are willing to take you for your money kind of like in Egypt, but mostly in the south. I did not like the south and happy to be heading north. This country is most Atheist, the outward appearance of Mosques and churches are only that, as in a facade. This country is far from being Islamic. If I walk down the street at 8am people are in the cafes drinking beer and rakia. I have met some very nice people, but their energy is shifty which is really based on fear that includes being timid, and a contemplating mind. 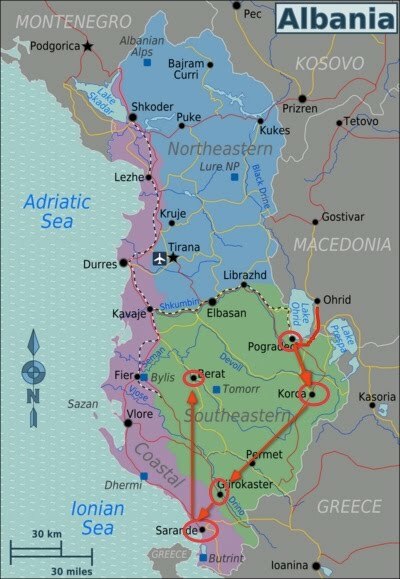 There is a solid reason why all the countries around Albania hate this country and its ethnic people. The prime reason is that the Albanians go to other countries to make money, and they steel, or work very poorly, and even are willing to kill for money, and the locals I have spoken with agree and are aware this truth. 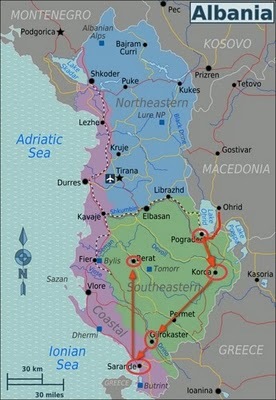 This country is precariously placed within the region of the Balkans and Albania does not fit. This might be the second most difficult country to travel next to Egypt so far, but the one thing that might drive me out quicker than expected is the bad food, but it is getting better going north, Berat has good food. The guy from Kosovo agreed that the food is awful. I mean I have never had such bad tasting tomatoes as in the south. But get this, the farmers are too lazy to farm the land in the valleys, so they import lots of their food. So think about it, all the surrounding countries hate Albania, so obviously they export the bad quality vegetables, and this country is stupid enough stemming from laziness to buy the foodstuffs. Another recognizable feature is that the education is much lower than the countries I have visited. It is just a strange country. I decided to head to Berat from Sardana. Berat is a very nice town, friendly people who are not acting like the victim and good food. The main north and south road was kind of rough, though. 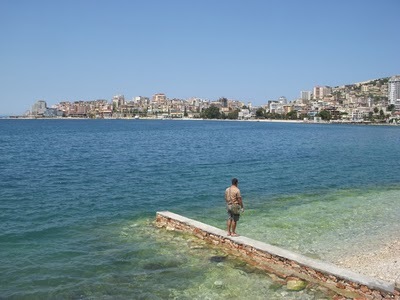 Yet, putting up with Egypt of 5 months, I think I can put up with Albania for awhile longer. I might have experienced some cultural shock, slightly, but recovered quickly. Next post: Hello WordPress.org, Goodbye Blogger! Previous post: Gjirokaster and down to Sardana.